This may sound like a joke to anyone who’s seen Mommie Dearest (and believes what they’ve seen), but legendary hanger-hater Joan Crawford won her Oscar for playing a woman who surely has to be among the saintliest of silver screen single mothers. In Mildred Pierce (1945), Crawford plays the titular heroine, a California divorcee struggling to make ends meet and raise a couple of daughters. One of those girls, Veda (Ann Blyth), has an excruciating fixation on affluence, which causes her to talk like a child’s approximation of a cultured being and lament her lack of the finest things in life. The sort of things Mildred is hard-pressed to afford. But a mother’s love conquers all, or at least, in this case, nearly wears itself out trying to. Mildred’s devotion to her daughters takes her from waiting tables in a restaurant to running her own successful hash house and juggling a romance with a wealthy, lackadaisical socialite (Zachary Scott as Monte Beragon). So, yes, Mildred is a family drama, a movie about children and parents, heartache and tears. But not so fast: This picture has a place in Film Streams’ current noir series for a reason. It’s as cruel and relentless as the toughest of the hard-boiled movies. And Blyth’s Veda in particular, an almost grotesquely sinister figure, is as deviously nasty as any Peter Lorre villain. Not to mention the fact that the novel it all came from was written by crime fiction titan James M. Cain (who also wrote The Postman Always Rings Twice, the film of which opens on Monday as part of this series). There’s some business with a murder, and the film is bookended by scenes in which Mildred is getting the third-degree from the cops (the picture plays out in flashback, between these scenes). This is all a bit leaden and not terribly interesting. What’s most important here is the heightened realism of the performances, and the intermittently achieved, Hollywood vision of working class life; the vicious interplay between mother and daughter, and the heart-stopping, blood-curdling smack landed across Veda’s face, after Mildred’s kettle has finally boiled over. Directed by Hollywood workhorse Michael Curtiz, Mildred is interesting for a lot of reasons, one of them being the way seemingly everyday drama is infused with a persistent, typically noir-ish paranoia. Much credit for that is owed to two other largely unsung Hollywood artisans: cinematographer Ernest Haller and composer Max Stiener. Curtiz’s dark ode to motherhood may not hold the cultish historical clout of a movie he made a few years earlier called Casablanca. 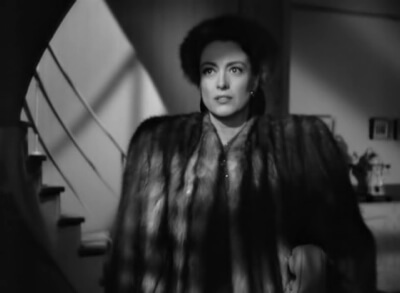 But for my money, Mildred Pierce is an altogether richer, more exciting picture. This is the iconic Joan Crawford movie, and a prime example of the (nearly) lost art of the Hollywood melodrama. P.S. – After catching the original on the silver screen, do yourself a favor and check out last year’s HBO miniseries, which was directed by Todd Haynes (I’m Not There, Velvet Goldmine) and stars Kate Winslet as Mildred, Evan Rachel Wood as Veda and Guy Pearce as Monte. A perfect supplement to Curtiz’s picture (as opposed to a replacement for it), Haynes’ expansive adaptation delves even deeper into Cain’s novel, returning it to its original depression-era setting and further unraveling the complex socioeconomics woven beneath the whole of the story.